A crowd of thousands took to the streets in this year’s annual Bloody Sunday march in Derry, supported by a range of republican and civil rights and justice groups. They were there to mark the day 13 people were shot dead by members of the Paratroop Regiment during a civil rights demonstration in the city’s Bogside on January 30, 1972. A 14th man died later from his injuries. 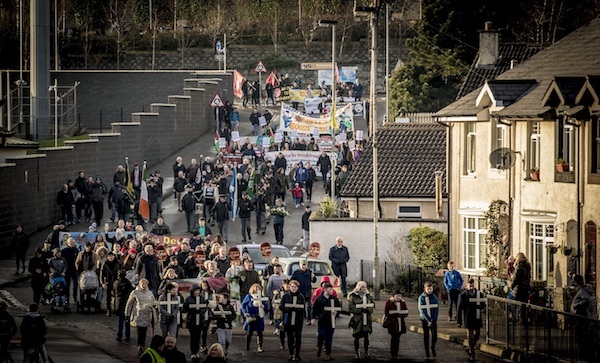 Thousands of people, accompanied by several republican bands, weaved their way down through the streets of Creggan and into the Bogside, retracing the steps of the original march. Organisers said they want the top British officials behind Bloody Sunday - including top-ranking General Michael Jackson - put behind bars. Former MP Bernadette McAliskey, who was one of the organisers of the march on 30 January 1972, said the families of those killed by British paratroopers are still waiting for prosecutions against the soldiers involved. Ms McAliskey told the gathered crowd that she will campaign until her last breath “to see Jackson, the British Army, the British government and the British state in the Court of Justice at the Hague”. The families learnt a few weeks ago of the death of Soldier N, who was among 18 soldiers being considered for prosecution by the Public Prosecution Service in connection with the attack. “In regard to the prosecution of those soldiers, we are not moving forward more than an inch at the time. ‘Soldier N’ has died. Family members are dying,” said Ms McAliskey. Kate Nash, who lost her teenage brother William on Bloody Sunday, told the crowd those behind the killings need to face court. “My brother was innocent of any wrongdoing. The perpetrators need to go to court and they need to face trial for what they did that day. He deserves it. We are all entitled to justice,” she said. The death of ‘Soldier N’ also raises questions for the PSNI police, said ‘Sunday’ survivor Michael Bridge. “The only people this benefits is the PSNI,” he said, speaking in advance of the march. “There are certain questions that need to be asked now. There has been an investigation going on now for eight years. “They have been investigating the conclusions of Saville which were that in total, 28 people were shot. It was a crime, a very serious crime. So, who is responsible for the delay in deciding on prosecutions?